The 10 states with the highest fatality rates all were red, while all but one of the 10 lowest-fatality states were blue. What’s more, the place with the nation’s lowest fatality rate, while not a state, was the very blue District of Columbia. Massachusetts was lowest among the states, with 4.79 road deaths per 100,000 people. By contrast, red Wyoming had a fatality rate of 27.46 per 100,000. The numbers are based on 2010 fatality statistics from the NHTSA. Silverstein asked a few sources to weigh in — including Thomas Frank, author of “What’s the Matter With Kansas? How Conservatives Won the Heart of America,” and former federal auto safety researcher Louis V. Lombardo — but they couldn’t quite put their finger on what’s going on. “It may be something we don’t have a definitive answer for,” Lombardo said. “This is someplace where you would not expect to see a partisan divide,” Frank said. I’m not nearly as smart as either of these guys, but I couldn’t help noticing that there are different travel patterns in the (mostly rural) red states and the (more urban) blue states. Perhaps that has something to do with it. The fact that DC is the “state” with the lowest rate of fatalities is telling. DC is the only place on the list that’s entirely urban, indicating that city living lowers the chance that a person will die in a car. It’s also where Barack Obama racked up the highest percentage of the vote. FairWarning’s ranking of fatalities is a stark reminder of University of Virginia Professor William Lucy’s findings that moving out of the city to a “safer” suburb can actually expose you to greater dangers. People drive faster on high-speed suburban arterials than on skinny city streets with lots of stop signs. But more importantly, people simply don’t drive as much in cities. They take the bus; they ride their bikes; they walk; they commute by light rail, metro, or commuter rail — in short, city dwellers have transportation options, so not everyone drives. And the less people drive, the fewer people die in traffic. Silverstein questions his own statistics, which show fatalities per capita and not per mile of driving, but he shouldn’t. Basing crash statistics on vehicle miles traveled ends up making heavy-driving states look safer. In the end, the more important question is: Where is it safer to live? This ranking of traffic fatalities correlates rather neatly with NRDC’s list of states with the best policies for reducing oil dependence, which we featured yesterday. The states doing the most to provide more transportation options and encourage compact development almost read like an Obama fundraising itinerary: California, Oregon, Washington, Massachusetts, New York, Connecticut, Maine, Maryland, Rhode Island, and Vermont. There are other factors Silverstein mentions, which likely play some role: state safety laws, access to top-level trauma centers, weather conditions, income and education levels. But the basic truth is that cities are safer. People who live in urban areas drive less, they drive slower, and they travel by other, safer, modes. So, you can vote Republican and still improve your chances of surviving all your daily trips. You just have to live in an urban place. The more transit-dense states probably do better because transit is safer. They’re also blue states. No surprise there. “Perhaps?” Of course the differences in rates are largely caused by lower per-capita VMT in urban areas vs. rural. What would be interesting to test, statistically, is whether VMT differences alone explain the observed differences in fatality rates, or whether there’s a separate political/cultural (“left” vs. “right”) factor. I suspect if there is, it’s very small … but I’m just speculating. The statistic is deaths per 100,000 people. I would like to see this statistic per 1,000 miles driven. Washington DC, Massachusetts, and New York have or in the case of Washington are metropolitan areas where mass transit is not used as much. Mass transit is not used nearly as much in Wyoming, Mississippi and Arkansas. None of this comes as much of a surprise. I’ve ridden in both NYC and NJ (during my college years). I definitely felt less safe on NJ roads even though the drivers there were generally more polite and law-abiding than NYC drivers. Why? Riding on roads with only a narrow shoulder, coupled with motor traffic whizzing by at 50 or 60 mph in a fairly narrow lane, leaves little margin for error by either party. A moment of inattention by a driver and I’m rear-ended by a vehicle going highway speed, with little chance of even seeing it far enough in advance to react. At least in NYC the roads where drivers go fast are multilane with plenty of manuevering room for everyone. You also have a significant number of streets where motor traffic actually keeps to 30 mph or less simply because it feels unsafe to go faster. It’s no secret that slower motor traffic makes for fewer fatalities, and also makes collisions less likely to occur in the first place. Sharing the road actually can work both in theory and in practice under such conditions. On the flip side, where motor traffic moves very fast, you really need to provide separate space for pedestrians and cyclists. @Komanoff:disqus: I agree it’s probably small, but there. I’m sure there is some self-selection involved too. People who are suspicious of other people might prefer moving to a blood-red state. Going back to my psychometric point, Utah and Ohio actually both seem like states that would score relatively low on the RWA scale. They have high degrees of political conservationism, but it seems to reflect more of a traditionalist outlook than a let’s-shoot-’em-first-and-ask-questions-later attitude that might be found in the deep South. 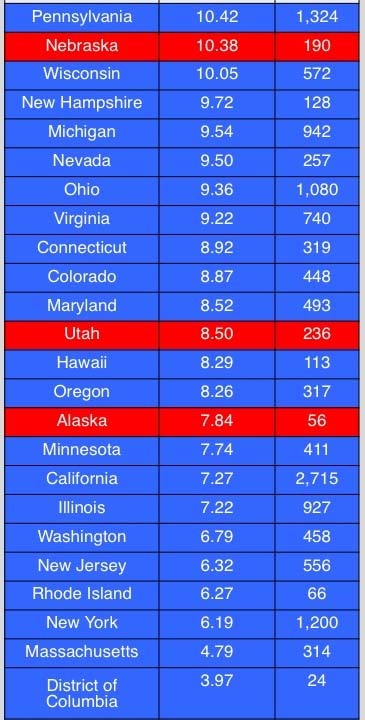 Sure enough, Utah even has a high VMT compared to some of the states near it on the above list. This post is extremely interesting, but the one thing that jumps out to me more than anything is the total deaths. 32,885. yes, 32,885. read that to yourself one more time still. 32,885. Red state, blue state, upstate, downstate, swing state, whatever state you want to call it… the problem is a state of mind. We as a nation barely lift a finger to stop 30,000 very preventable deaths a year. I’ve found the weapons of mass destruction; they’ve got 4 wheels, cruise control, and can be operated by nearly anyone for as long as live if they merely prove that when they’re 16 they can parallel park between two orange cones. This system of car dependency and crafting infrastructure around cars is beyond archaic and irrefutably dumb. We don’t just some speed humps and chicanes; we need a top to bottom complete streets revolution. I agree, we need to see fatalities per 1000 miles driven. Also more interesting would be the correlation with density. If you’re comparing using per 100k people in Wyoming, with its vast expanses, it will necessarily drive up the percentage when put in terms of per person when taken against the vastness, but when taken against the density, it will put it in perspective. I’d venture to guess a density comparison would turn this chart completely on its head. I agree with commenters below; it would be interesting to see a comparison of fatalities per mile driven. If there’s no significant difference between states, all this shows is that if you drive more, you’re more likely to die in a car crash, which shouldn’t exactly be surprising news. As someone raised in the 13th worst state (red) and living in the 9th best (blue), I can tell you that it’s not at all related to attitudes or driving behaviors linked to political party. California drivers drive faster and more aggressively than Louisiana drivers. It’s very simply that the deadliest states have residents who travel more miles in fast moving automobiles, whether it’s across town or across the state. Period. As the article points out, using VMT only to compare states only compares deadliness of their roads and ignores that in the safer states, there are generally alternative, safer ways to get around. Perhaps a combined model that includes density along with VMT would show differences in those states where relatively short distance trips–the kind that are more viable by transit, car or walking– require automobiles or there are other options available. safe place to live *because* you “have” to drive more miles. church and back on Sunday? Tanya & Streetsblog, if you’d like my spreadsheet and data sources, let me know at my screen tag @ gmail. Could time spent in cars be a factor here? In places like DC, Massachusetts and New York, I have to image the average person spends less time in a car than the sprawling states of Wyoming and Mississippi. Less time in a car = less likely to die in a car. That’s my best guess. How do these numbers correlate with:1. continuous lengths of country roads (which “invite” speeding),2. alcohol use3. # of sworn law enforcement (which could suggest a number of things, including high # of deaths in high-speed chases, or people run off the road by police, and many other possibilities)Because I have a feeling you may find your answer there. How does the Overall US rate compare to other industrialized nations? So based upon northendmatt’s data, you get pretty much the same result per vehicle miles traveled as per capita. So more driving in rural red states does not fully explain this. @Geck – there could be a lot of factors. In California we have a lot of urban areas with lower speed limits, and our freeways are often congested resulting in lower speeds. @Geck:disqus Yes, the conclusion seems to be that in rural states, you have a higher chance of dying in a car crash both because you drive more, and because it’s more dangerous per mile. @twitter-14678929:disqus is correct to point out that lower speeds are correlated with lower fatality rates. The next step, in my opinion, would be to look at the breakdown of crash type, which is data that should also be available. My hunch is that in rural states you will see a lot more single-vehicle crashes, the reason being that I do not think the risk of crashing from fatigue scales linearly with distance driven, i.e. driving 100 miles a day does not put you at 10x the risk of driving 10 miles a day, but at something more than 10x. Could it be the speed at which people drive? You write, “city dwellers have transportation options, so not everyone drives. And the less people drive, the fewer people die in traffic.” But note that cities are clogged with traffic. However, the traffic is slow moving meaning that there are fewer fatalities but more fender benders. That’s my guess. It’s also interesting if you look at density. NYS has the third lowest (!!!) rate per 100,000 people but still the total number of deaths (1200) is higher than most of those red states with rates per 100,000 that are 3x or higher than NYS. Or look at CA: 2715 deaths!!! More than the top 5 red states combined. I didn’t bother adding it all up but it seems that more people were killed in the blue states just because they have very large, dense urban areas. The article refers to “traffic” fatalities, but many of the commenters so far are referring to the statistics as reflecting fatalities only while driving. Tanya, can you offer any clarity as to whether these statistics also include fatalities involving bicycles, pedestrians, or transit vehicles? If so then I feel that makes an even clearer distinction between the safety of more dense, urban states as opposed to more rural ones. If not then the study is not as surprising, making a simple claim that the longer one drives in a car the more likely they are to die in a car crash. Ok, I just checked out the data that the study was based on and all traffic fatalities were indeed included, not just those of car drivers. This fact makes the study more significant in my mind, offering the potential conclusion that moving more people out of cars and onto bikes, transit, or their own two feet, results in a significant safety gain. It looks like in the 2010 data that the study used the % of ped fatalities actually went up from the previous data period, but still this was not enough to offset the overall net safety gain received from lower automotive mode share. Calling motor vehicles “weapons of mass destruction” is an overstatement. One of the reason why Americans tolerate 30,000+ fatalities is that deadly vehicle collisions usually kill individual citizens or single-digit groups. As someone pointed out, it’s the equivalent of a loaded jet airliner “buying the farm” every day or two, but because airplane trips are rare for most of us, while cars/SUVs/minivans are a part of everyday life for the typical American, most of us don’t clamor for a remedy to this toll. Also, many of the victims are from the lower socio-economic levels; their deaths are not “newsworthy”. One can also question the term “weapon”–cars are a means of transportation, while weapons are specifically designed to kill, injure, or at least intimidate. I remember one co-worker who said, “I’d like to see everyone who drives worse than I do have their licenses revoked.” While it will be good to reduce auto-dependency, there’s a lurking fear among some that we’d wind up with the rich folks and government officials traveling in cars and limos, while the rest of us ride bikes (whether we like to or not) or take poky, crowded transit buses. Take a look at Median Household Income by State, then things will start making sense; or at least get you going in the right direction (pun intended!). Add a column for statewide transit commute mode share or non-auto mode share and see how it lines up. Also note that 5 of the top 10 deadliest states are in the South. I lived in TN, and yes the drivers are crazy. Among some of the factors: Growth patterns that encourage long commutes (the “Atlanta model”), urban expansion into rural areas with 2-lane roads not designed for fast traffic, rampant speeding above the posted limits, poor urban planning, few alternative for walking and mass transit. Many newly built up areas completely lack sidewalks, and often the “token” bus service is a joke! Like everywhere, a lot of old, gentile neighborhoods have been defaced by running a virtual (if not actual) highway through them. Not surprised to see Georgia, the place where a mother can be convicted of vehicular homicide for crossing the street (http://usa.streetsblog.org/2012/09/11/georgia-prosecutor-continues-case-against-raquel-nelson/#comment-649829668), in the top 20. I think density is the underlying cause. Red states tend to be rural states where people drive very long distances and so have more traffic accidents and fatalities. Blue states tend to be more urban, so people drive shorter distances and have fewer accidents per capita. Think about how far the average person living in Oklahoma drives each year, compared with the average person living in Brooklyn. Maths-wise, I think the author’s explanation is correct. The primary explanation is probably the higher concentration of cities, especially large ones, in the blue states than in the red ones. City dwellers travel fewer vehicle miles. Even if the accident rate per mile were higher in cities than in rural areas, the city miles will be at lower speed, so the fatality rate could well be lower, and the city dwellers will drive fewer miles per capita. That said, there are a few outliers. Maine, New Hampshire and Vermont are relatively rural blue states that don’t have very high fatality rates per capita. There might be something going on in those states with stricter traffic rules. Or maybe stronger DUI enforcement. Either way, if we knew fatality rate per VMT, we would be able to get at differences in traffic regulations (although average speed would probably confound that analysis). Priuses are very safe vehicles, and don’t go very fast. FWIW I looked at a bunch of the traffic fatality data comparing European countries and the U.S., particularly looking at what those countries with far lower per-capita injury and fatality rates did that was so different than the U.S. The main conclusion I came to is one that many of you are arriving at here: The countries with lower traffic injury and fatality rates simply drive less–in many cases, far, far less than we do in the U.S. And their injury and fatality rates showed that clearly. In short, the single best way to improve the safety of the automobile is simply not to drive it. @facebook-506751787:disqus NH, Vermont & Maine are rural, but the roads are underdesigned: hilly, curvy, dark. There’s no illusion of safety when driving there, and there’s plenty of snow, ice, and largish-wildlife that will happily kill you if you hit them (think moose). I also suspect the average distance-per-trip is lower in New England than it is in the larger states, perhaps because towns & services were established before cars were widespread, so you have to go less far to get to a store that will sell what you need. Davistrain Calling motor vehicles WMD is totally accurate if you look at speed v Fatality charts and pair that with the single-shot fatality rate used to classify WMD. Motor vehicles and small arms cross fatality rates based on terminal ballistics somewhere between 20 and 25 MPH as small arms are 9% fatal when they hit a human target and motor vehicles go from 5% fatal for an unarmored target (cyclist or pedestrian) at 20 MPH to 50% at 30 MPH. The accepted cutoff between a small arm and a (simple)WMD is 50% per shot. Grenades inside 15 Meters are a (simple)WMD. So are motor vehicles, in fact driving a motor vehicle into civilians or unarmed soldiers (assumed enemy soldiers, not friendly) is a war crime. Now when motor vehicle speeds get up around Texas arterial levels (50-60 MPH real world speeds) Then you start getting fatality rates against unarmored targets that are just horrific, with over 95% at 50 MPH and 99+% at 60 MPH. These are speeds that are routine in residential areas, and I wish I was exaggerating. The only thing that keeps our pedestrian fatality rate so low is the serious lack of walkability pretty much put everyone in a car. No sidewalks and miles to go to get to anything except another house combine to “everybody drives”. Because the have to. One question worth asking: how does car safety factor in here? While we were driving through Wyoming we also saw things like a dad driving with a 2 year old on his lap late at night. Doubt he was wearing a seatbelt, and she she was obviously not properly secured in a carseat. I’m not saying everyone does this, but might residents of blue states be more likely to properly use seatbelts and appropriate carseats? What about the cars – do more people in those states use older cars that aren’t as safe? To Bolwerk’s comment about less empathy in the red states, add the belief that God will take care of them. I didn’t know that a grenade was considered a “weapon of mass destruction”–I considered that term to mean atomic weapons or large conventional-explosive weapons, things that cause fatalities in the hundreds or thousands with one blast. But my guess is that it is mostly related to speed. Rural means spread out, which means you drive at highway speeds (although often not on a safer highway), and speed is the main ingredient for traffic fatalities. The most important is that the driver should know the rules and precautions in driving. And never forget to put seat belt on. I think there may be a causal correlation between the quality and speed of emergency medical care and the number of traffic fatalities per capita. Big sparsely populated red states like Montana and Wyoming rarely have a hospital nearby, and it takes longer to respond to accidents than it does in more densely populated (blue) areas. And the availability of experienced doctors (especially specialists) who really know their stuff and the availability of fully staffed hospitals with state-of-the-art medical equipment is probably pretty limited in more sparsely populated (red) states as well. And then there’s the possibility that fiercely independent government-hating Right Wing Nut Jobs in Red states may be less likely to follow laws (like using seat belts) they find too authoritarian and intrusive. I agree that people in urban areas drive less, drive slower, and use alternative means of transportation. I also agree that urban areas have more of everything than rural areas, including quality and availability of trauma centers. But I think there’s more to it than just that, because of something else I have observed: Democrats tend to have a positive attitude toward government, and are more apt to obey its laws; while Republicans tend to have a negative attitude toward government, and wish it would stop meddling in their business and just go away. In 2012, I drove behind a great number of vehicles with campaign stickers on them. Something I’d been observing even before this article suggested to me a partisan divide in driving skill is this: drivers of vehicles with Obama stickers signaled practically every lane change or turn, while those with Romney or McCain stickers very rarely signaled a turn, and almost never a lane change. Vehicles with Ron Paul stickers were hit-and-miss. And I haven’t been able to notice any patterns in red light running because, as common as it is in Springfield, MO for people to keep their feet on the gas all the way through yellow and even the first 1-2 seconds of red; the offenders are usually either heading in one of the other three directions, or blowing past me. 2010 Traffic Fatalities Could Fill 70 Jumbo Jets. And This Is Good News?